Conductive Hearing Loss sadly turns the sound down in many people?s lives ? especially as they age. Put simply, it?s caused when something blocks or damages the middle and outer ear and impairs the body?s ability to conduct sound-waves. As few people are born with it, the condition is something that develops over the course of a lifetime. What does it sound like? Easy: plug your ear with your finger ? with a finger blocking the ear, sound cannot easily reach the inner ear. It also sounds like an elderly relative repeating ?What did you say?? to everything you don?t scream at them. 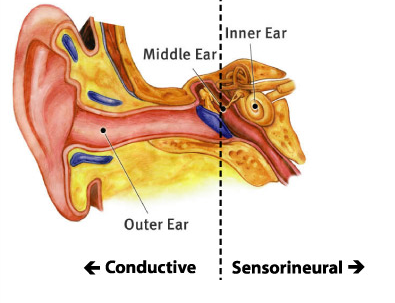 The causes of Conductive Hearing Loss are varied, but they fall within two categories: congenital (ie. occurring at birth) and acquired. The most common is acquired as the slow degradation of hearing, which is caused by exposure to noise over the course of a lifetime. When this occurs, it?s often hard for a person to notice, as the change occurs so gradually as to be unnoticeable. In many cases problems also occur when illnesses such as colds or sinus problems can affect fluid build-up and create problems in the middle ear and ear drum. In others, it can be caused by foreign object, like earwax or water, or something like a tumor, ear infection or any allergy 1 . Sometimes hearing loss occurs suddenly, such as in the case of damaged or perforated ear drums through a rapid change in ear pressure. Some form of trauma, such as a sharp blow to the ear, an explosion or a loud noise, can all potentially damage the ear and cause hearing loss (source). The journey from newborn to old age is a long one, and many changes occur along the way. Our ears are not immune to this: hearing loss exists in only 5 out of every 1000 newborn babies, but over the course of a lifetime this changes to 1 out of every 3 with some form of hearing impairment. While some of this is down to the body getting older, it doesn't mean that people can?t take some precautions to improve their chances of keeping their hearing and quality of life. People are often cavalier about their hearing. Every day we expose our ears to some awful abuse, from subway noise, loud machinery and Justin Beiber. The damage to the ears isn?t always readily noticeable because it?s a gradual process. Over time, repeated exposure to noise is what damages ears. In most cases noise exposure is a simple thing to guard against. Earplugs and other hearing protection devices should be worn in high-noise environments. Taking a couple of small foam earplugs to live gigs is always a good idea. Don?t worry about looking foolish ? look closely and you?ll see them worn by venue staff. A set of larger rubber ear muffs are great for operating machinery, and ear buds or other headphones should never be played directly into the ear at high volume, as this is a very common cause of hearing damage. These are practical ways of reducing exposure to loud noises, but it?s also handy to get checked at the doctor. Many people visit their GP for a yearly check-up, or will monitor changes in their own bodies like moles, lumps and bumps, yet doctors don?t often screen for hearing damage and people don?t ask for it. It?s something that should be included in any doctor visit. Everyone has got the aged relative that refuses to believe something is wrong with their hearing ? yet expects you to turn the television up all the way. 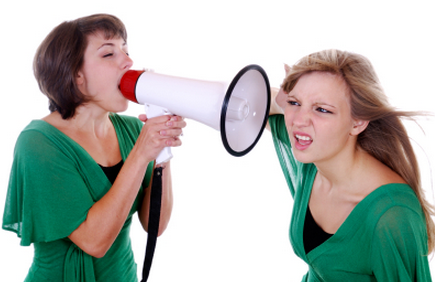 Admitting to hearing loss is something that people seem unwilling to do, yet alone want to treat. As it can affect quality of life, it?s important for everyone to monitor their ear health. Children with a hearing impairment can perform badly in school, and adults can miss out on communicating effectively with others. Treatment can be available for Conductive Hearing Loss, depending on the particular situation. As the causes for the condition are varied and produce different symptoms in different people, it only stands to reason that treatment and its efficacy will also be as subjective. Where possible, any obstructions are removed, such as fluids or earwax. As these can become as ongoing problems, such as in the case of infection, it?s important to see a specialist to ensure they doesn?t reoccur. Medications are also available to improve hearing loss in some cases. One of the most common treatments is through the use of hearing aids, which amplify the native soundwaves in order for the user to hear them better. This is a good option for light to moderate hearing loss, but as it is largely down to individual needs and preferences, it?s not always the best option. For instance, some people don?t like to be seen wearing a hearing aid, and if the condition has been caused by infection, wearing a device in the ear may aggravate the situation. In some cases, surgery is also an option. As it is a rather drastic one, it should be considered only after consulting professionals and as the recommended option. One such procedure is getting a Cochlear implant. While it doesn?t ?fix? the ear so the person can hear normally again, it can help in some cases. Other surgical procedures involve correcting any problems with the bones of the inner ear. It should be mentioned that in some cases, especially in hearing loss caused by ageing, there is no cure, but there are options to improve hearing. At the annual doctor?s check-up, or when you?re next in at the GP, get a hearing test done. Turn your headphones down slightly. Wear earplugs or other hearing protection when exposed to loud noises, such as power tools, machinery or live music. As you can see, avoiding acquired hearing loss doesn?t require much effort, yet it can have a big impact in quality of life, something especially important in later years. For such a common and easily-preventable problem as hearing loss, it?s surprising that more people don?t treat their hearing with the care they should. Losing the full abilities of one of our senses is something that we all dread ? yet it?s something that we often don?t do anything about. The Hearing Loss Pill is a viable treatment option for those experiencing Conductive Hearing Loss. The pill improves hearing performance by targeting the nerves within the ear that are still functional. The Hearing Loss Pill not only optimizes the organ for receiving sound but also guards against further damage. Click here for further information.